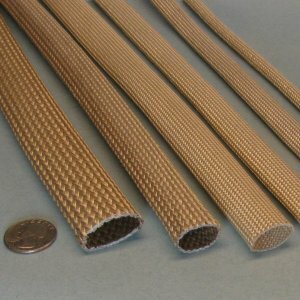 This high temperature, heat & flame resistant and thermal insulating braided fiberglass sleeve is fabricated from high quality type E fiberglass that will not burn and will withstand continuous exposure to temperatures of 1000°F / 520°C. 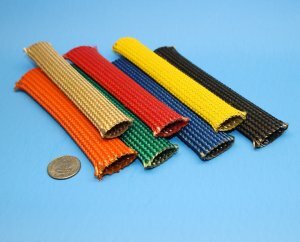 This high temperature sleeve provides protection for industrial wires, cables, hoses (hydraulics), piping and tubing. Provides thermal insulation and personnel protection. An acrylic saturant is added to the braided sleeve, which adds rigidity and abrasive strength & also reduces end-fray. The added rigidity results in a sleeve that is easy to apply over long lengths of hose or cable. 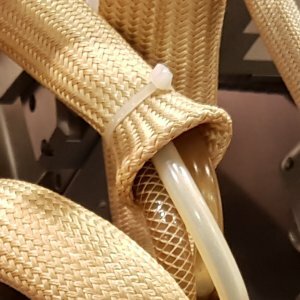 Another feature of this product is the large braid angle, which allows for significant expansion factor of the sleeve if necessary. The acrylic will smoke off if heated above 450F. This sleeve is used for protection of wiring in appliances, electric and electronic devices and lighting fixtures. The acrylic saturant provides anti-fray sleeve ends - which can be folded inward and rolled, creating a practical sleeve end to protect the entry of wires, lines, hoses and cables.